A heart rendering story with electrifying performances from the two leads, Villain works both as a powerful character study and as a gripping thriller with enough twists and turns to keep you guessing throughout. 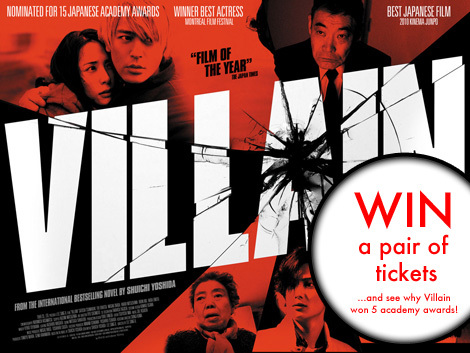 This competition is for a chance for two separate winners to win a pair of tickets to see “Villain”, a new Japanese film that is being released at select UK cinemas on the 19th August. We have tickets for the showing at the Institute of Contemporary Arts in London where you can choose any date that the film is showing between Friday 19th August and Thursday 8th September 2011 depending on seat availability. Please contact us if you are the winner of the competition and let us know your preferred date so we can confirm tickets for you. We have two pairs of tickets for our competition this week so you have double the chance of winning! I am sure you all know the drill by now! This competition is running on both Facebook and Twitter, so choose your social media platform of choice and head over to our Facebook page and leave a comment on the competition post or enter the competition by following our Japan Centre Twitter feed and re-tweeting the competition tweet! We will choose a random winner from everyone who leaves a comment on facebook or re-tweets on Friday 19th August and let you know over the weekend if you have been chosen. Good luck everyone and look out for our new Japan Centre competition next week. Posted in Food and tagged Cinema, competition. Bookmark the permalink.